Silver investing has yielded generous returns this year compared to investing in other precious metals. As of 11:30 a.m., silver prices today (Friday, Feb. 24) trade at $18.35 and have seen a 2017 return of 14.8%. That outpaces the gold price gain of 9.2% and platinum price gain of 13.6% over the same period. Even more important is how the price of silver has nearly tripled the Dow Jones Industrial Average's year-to-date gain of 5%. In fact, the Dow Jones' insane rally over the last two weeks is typically bearish news for silver prices. 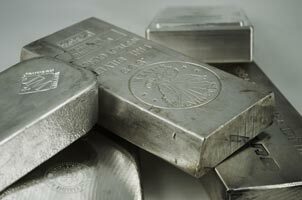 But Money Morning Resource Specialist Peter Krauth believes the price of silver will gain 19.9% by the end of the year – and that's being conservative. Despite being down 0.3% as of midday today, the Dow Jones has been on its longest winning streak in three decades. From Feb. 9 to Feb. 23, the index has closed at a new all-time high every single day. It has climbed 3.8% over that period to its most recent settlement of 20,809.91. The Dow Jones rally started on Thursday, Feb. 9, after Trump teased that his tax cut plans would be implemented sometime this year. Urgent: For only the third time in 20 years, a metal more rare and more exotic than gold is about to make stock market history. And it's poised to make early investors a lot of money. Get the full story. A soaring stock market is usually bad news for silver investors. When stock prices keep going higher and higher, investors think there's no way they can lose money. That urges them to withdraw their money from safe havens like silver and put it into stocks. After all, safe-haven investments are most attractive during times of stock market volatility.